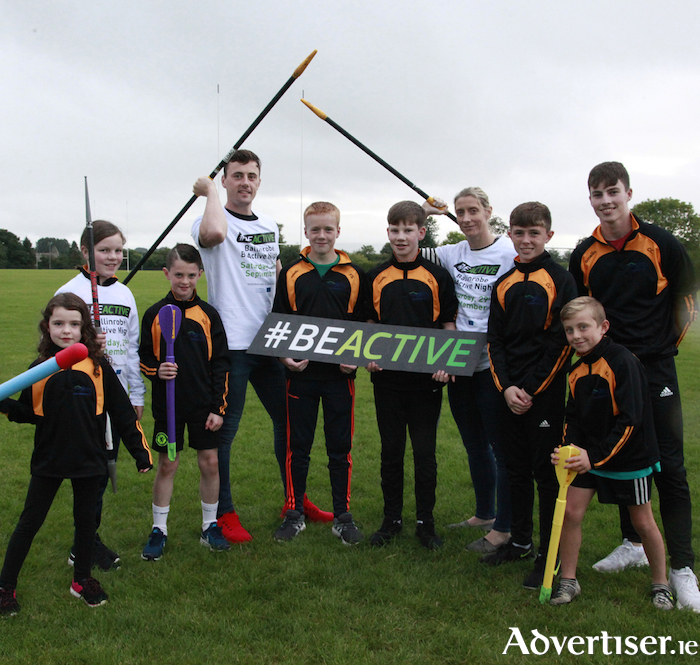 Pictured at the launch of the Ballinrobe Get Active Night “Festival of Sport” on Saturday September 29 were Mayo GAA stars Diarmuid O'Connor and Cora Staunton with young sportspeople from Ballinrobe. With two weeks to go preparations are in full swing for the Ballinrobe #BeActive Festival of Sport Night taking place on Saturday September 29 at the Green in Ballinrobe. The event, to be held in conjunction with the European Week of Sport will commence at 5pm and includes a family sports challenge (incorporating many different sports including GAA, soccer, rugby, athletics, boxing, cycling, golf etc ), traditional games, bouncy castle/fun inflatables, fitness challenges, adventure zone, inclusive games, and a Family 3km fun run/walk. Following this family fun event at 7.30pm there will be an opportunity for members of the public to view and experience some of the activities on offer at the newly refurbished Lakeside Sports and Fitness Centre. Highlight of the evening will be the formal switch-on of the improved lighting at the Green in Ballinrobe, by Minister Michael Ring. Funding for the scheme was accessed through Mayo Sports Partnerships in an application for a Ballinrobe Sports Hub under Dormant Accounts supported projects via Sport Ireland. The Green which is a sporting hub for the community, is widely used by many sports groups and by the wider population for general activities such as walking, jogging etc. Since the formation of the Sports Hub earlier this year, with the help of An Tacu Family Resource Centre, Hub Co-ordinator Janette Slattery has been busy getting a Ballinrobe Sports Network together. This #BeActive night will be an example of the collaboration work of all sporting groups / clubs in the community. Janette Slattery explained: "The event aims to showcase Ballinrobe as an active town providing opportunities for people of all age/ability to participate in a fun and cost free event. If groups wish to get involved they can contact the Ballinrobe Sports Hub at (087 ) 6091463." It is hoped that some well-known sports personalities will be in attendance to try out some of the challenges. Many organisations including Sport Ireland, Mayo County Council, Mayo Sports Partnership, An Tacu Family Resource Centre, Maple Youth Centre, Ballinrobe Festival Committee, Ballinrobe Town Park Committee, Ballinrobe Sports Network and others are pooling resources in an effort to make the day a success. Many local businesses are also providing much needed support on the day. Mayo Sports Partnership co-ordinator, Charlie Lambert, stated: "The support has been tremendous from all sides and on behalf of Mayo Sports Partnership I would like to thank everyone who has contributed towards making this event a success." So pencil in Saturday evening September 29 from 5pm to 7pm at the Green Ballinrobe for an unforgettable experience. For further information on how to enter any of the above events or on the day in general, contact Mayo Sports Partnership at (094 ) 9047025. The public is asked to note that the Green will be closed to traffic from 2pm to 8pm on Saturday September 29 to facilitate the activities of the festival.